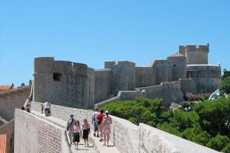 Walk Dubrovnik's famous walls to gain a new perspective on this medieval paradise. As this was a charter cruise I do not know if this is the standard tour. Really could have done this on our own. Really could have done this on our own. Couldn&apos;t really hear the guide with the chinsy headsets. You get the best bird&apos;s eye view of the city this way and a little exercise too. Game of Thrones tour and walking walks! Game of Thrones tour and walking walks! Phew lots of walking. Be in shape for this one. Amazing experience and felt safe and wanted by locals. Did the Game of Thrones tour. Did the Game of Thrones tour. It was a lot of exercise but great views. They allowed people with limited mobility, so we had to restrict the itinerary from what was advertised. A nice experience, but it could have been better. beautiful city and scenery. We did the Game of Thrones Tour to be specific which included walking the walls. Tour leader well informed, shared personal experiences he endured during the civil strife that Croatia experienced almost 25 years ago. Sea is very clear and the town well looked after. Also visited one of the Game of Throne sites. Game of Thrones tour but still saw the old city and climbed lots of steep stairs. Also included visits to other locations featured on "Game of Thrones" HBO TV Series. Also included visits to other locations featured on "Game of Thrones" HBO TV Series. Lots of walking and steps on worn cobblestones. Wear comfortable shoes. Fantastic views and great history too. Fantastic views and great history too. A value priced extra but a must do (if you can). Excellent tour, excellent tour guide. Excellent tour, excellent tour guide. She was very well organized and very well informed. Set a good pace for the tour so no one got left behind but no one was standing around waiting too much either. Beautiful view of the scenery and excellent local guide. Beautiful view of the scenery and excellent local guide. Delicious gelato, too! We arranged a tour with Game of Thrones Dubrovinik Toursl. Beautiful views - lots of steps!! Beautiful tour to see the old city and the surrounding sea. Beautiful tour to see the old city and the surrounding sea. Architecture was very interesting to see.